Originating in Hungary during the 16th century, the Komondor was a favorable choice for farmers and other landowners. During this time, Komondors were used to protect cattle by day, and the family by night. Once WWII broke out, the Komondor faced a close extinction. Breeders who took a great liking towards them worked hard to preserve the Komondor ancestry until they were finally able to get their population to a normal rate. Within the following years, the Komondor made its way to the United States but remained a rare breed outside of Hungary. Then in 1937, the Komondor was officially recognized by the American Kennel Club for being a registered breed in the U.S. If the Komondor could be characterized by one specific trait, it would be their protectiveness. Not only are they alert, but they are also very cautious around strangers. They feel that their main purpose in life is to protect their family at any cost. While this can be an admirable quality, it can also be troublesome if the Komondor is naturally aggressive. The Komondor is so protective over the ones they love that they will even follow them around the house and watch their every move. If you want a dog that is completely devoted to loving and protecting you and your family, then the Komondor may be the right pet for you. If you are a new dog owner and lack experience in dog training, then don’t get a Komondor. These dogs need a firm and experienced trainer in order to learn simple commands and appropriate behavior. They tend to be very independent and are not afraid to show a stubborn streak if challenged in any way. However, with the right owner, they can be a well-trained companion in no time at all. It is also critical that this breed is socialized at a young age. Introduce them to unfamiliar people, places, experiences, and other pets so they learn how to properly interact with new things. This is especially important because Komondors have a reputation for being aggressive towards other animals. If you are still having troubles training your Komondor, consider enrolling him in a puppy training course. For being a large dog breed, the Komondor doesn’t need extensive exercise on a daily basis. They don’t crave activities like most other breeds, but it is still important to take them for several walks a day in order to keep them at a healthy weight. On average, the Komondor lives to be about 10 to 12 years old. Even though the Komondor is a popular breed in their homeland, they have never been able to reach that same status in the United States. As of right now, the Komondor breed is ranked as the 177th most popular dog in America by the AKC. Because of their large size, the Komondor should be fed between 3 to 4 cups of high-quality food a day, split into two equal meals. This amount is a general recommendation, and it’s important to consider your dog’s size, age, weight, metabolism, and activity level when creating a proper feeding regimen for him. 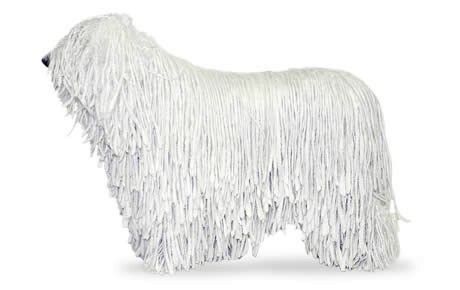 At first glance, the Komondor has a strikingly unique appearance. Their white coat forms long cords, resembling the head of a mop. While they don’t need weekly brushing like most other breeds, their coat still requires a lot of grooming maintenance that’s specific only to this breed. The cords need to be dried, separated and moved regularly in order to keep them clean and in good condition. Are Komondor Good with Kids? Komondors can be very loving and protective over the children in their family, but that’s not the case for other kids that they’re not familiar with. Whether it’s a strength or fault, this breed’s protectiveness can become problematic around a group of toddlers. Just like with any breed, parents should always be present when a child and Komondor are interacting with one another. Gastric Torsion: Gastric Torsion, also known as bloat in dogs, occurs when the stomach fills with air or gas and then twists. This puts extra pressure on nearby organs, while also prohibiting the body from belching or vomiting to get rid of the excess gas. Once this happens, the blood becomes restricted to the heart, which can make the animal go into shock and eventually die. Hip Dysplasia: Hip Dysplasia in dogs is a common degenerative disease found in many breeds. This occurs when the hip socket and thighbone no longer fit properly together, causing the joints to grind and rub against each other. In severe cases, arthritis may result. Entropion: Entropion in dogs occurs when the eyelids begin to roll in, causing discomfort, irritation, and possible damage to the cornea. If the condition is causing damage to the eye, then corrective surgery may be recommended.